Two Bears Farm and the Three Cubs: Someone is a Little Broody - and it's NOT me! Someone is a Little Broody - and it's NOT me! Foghorn has been sitting on a golf ball for 2 weeks now. She's broody. 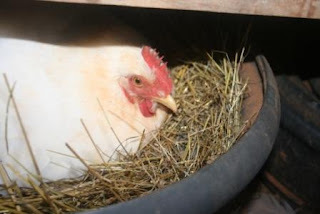 When chickens get broody, they sit on the nest most of the time. They stop socializing. They just kind of hunker down, ready to hatch a baby. In this case, Foghorn is also not laying any new eggs. When I try to check, she makes funny aggressive noises. I check anyhow, and so far she hasn't pecked me. Now I'll tell you, I am the first to admit that I know virtually nothing about golf. But I'm pretty sure that ball isn't going to hatch. Oh my word, that is too funny! A golf ball! That post was so darned funny - love your wording!!! She looks pretty "determined" to GIT R DONE! Thanks for the smiles! You know this begs the question, "How did the golf ball get there in the first place?". Very funny post though!